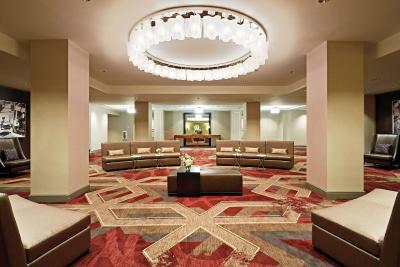 Lock in a great price for Hilton Richmond Downtown – rated 8.9 by recent guests! We had to wait 40minutes Sunday morning to get our car from valet! We missed our flight due to this! My mom and I enjoyed how beautiful the property is. We took so many pictures during our stay for my birthday weekend.The staff was very friendly and made us feel right at home. Our waiter and hostess were very nice and friendly! The bed was amazing, everyone was helpful and polite. It was also very clean!! Will stay again. Very interesting facility. Interesting ties to historic context of the hotel. Well kept finished, interesting art elements and great amenities. My wife took advantage of shuttle service and was very pleased. All in all a wonderful experience. The bed is amazing. Shower was great and good water pressure. Friendly staff, close to everything we wanted to do. The valet and check-in staff were extremely friendly and everything went smoothly. The room was very nice and the beds were comfy. Hilton Richmond Downtown This rating is a reflection of how the property compares to the industry standard when it comes to price, facilities and services available. It's based on a self-evaluation by the property. Use this rating to help choose your stay! 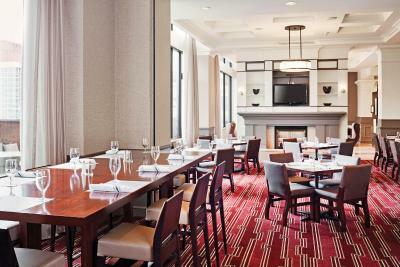 Located in the city center of Richmond, VA, this hotel is 6.8 mi from the University of Richmond. An indoor pool with hot tub is available along with rooms that include free WiFi and cable TV with HBO. Every room at the Hilton Richmond Downtown provides a refrigerator and iPod docking station. Coffee facilities are also available in each room. A 24-hour convenience store is on site at the Richmond Hilton. A gym and a 24-hour business center are also available. There are two restaurants, a cocktail lounge, and a coffee bar on-site. Hilton Richmond is 54 mi from Busch Gardens Williamsburg. 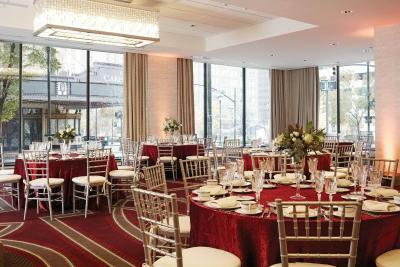 When would you like to stay at Hilton Richmond Downtown? This room features a refrigerator, cable TV, and a work desk. Private parking is available on site (reservation is not needed) and costs USD 27 per day. This room features a refrigerator, cable TV, and a work desk. A sofa bed is also included. This suite has a cable TV and air conditioning. This quadruple room has air conditioning and executive lounge access. House Rules Hilton Richmond Downtown takes special requests – add in the next step! Hilton Richmond Downtown accepts these cards and reserves the right to temporarily hold an amount prior to arrival. Breakfast was cold, no food choices, everything on buffet was cold, & it cost $45 for 2 people. I can’t think of anything that I didn’t like. I have already started making arrangements for my next trip here. The walk to our room after getting off the elevator on our floor was very long! Great location. Nicely decorated. Very clean. Very pleased. It was super clean. Bed was amazingly comfortable and staff has been awesome. Only wish we had another night to stay! The pillows sucked. Breakfast not included.